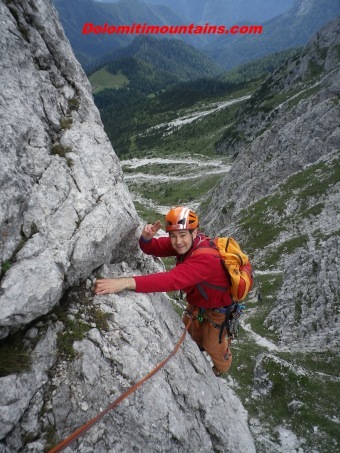 Dolomite alps are the best place for the practice of Mountain Climbing. Its high peaks with vertical walls of strong rock and wonderful shapes attract many alpinists. You may ask what is Mountain Climbing? It is the art of climbing a mountain by ones own forces and reach the summit. We refer to an "art" because each alpinist is the creation of a personal work, it is a unique experience. It more a practice than a simple sport. Knowledge of the environment where the achievement happens, with its geography, zoology, meteorology, history, and technical skills which are necessary to proceed safely. This art can be expressed in the summer but also in winter when the alps changes its appearance and gets covered by a white mantle of snow. During the cold season the challenge is still the alpinism but the technical environment changes completely. In winter you can go up to the walls, but also ice and snow. All of this using the appropriate tecnique and gears. In summer you can reach the peaks where Man, using the lines of nature, has designed various high routes, from the easiest, where sometimes you just walk, to the most difficult, where only a few "elected" are able to go. These lines differ in difficulty. Each one is characterized by a grade number to indicate its severity, ranging from the first degree (when one is forced to use hands in order to proceed) to the eleventh degree, that only a restricted élité in the world is able to overcome. There are other difficulties where all able-bodied people can express themselves between these extremes. Among them we mention the fourth degree, where the walls become vertical and climbers must begin "pulling" by arms, the sixth degree, that remained the upper limit of Mountain Climbing for 40 years, and the seventh degree, that has opened up the difficulty scale. In the minds of outsiders of this art, the sixth grade is still considered the highest level of Mountain Climbing. Somebody already knows the great walls of the epics of sixth grade: we refer to the 20 years between 1930 and late Forties. Many important ways of Mountain Climbing involved the Dolomites: the North wall of Tre Cime di Lavaredo, the North-West wall of Civetta, the South wall of Marmolada, the South wall of Tofana de Rozes, the North wall of Sassolungo, the East wall of Sassolungo, the East wall of Catinaccio, and the villages and towns where the alpinists stayed, like Cortina d'Ampezzo, Misurina, Auronzo di Cadore, Calalzo di Cadore, Agordo, Alleghe, Canazei, Ortisei. All the walls of the Dolomites are crossed by a network of ideal lines that rise to the top nowadays, and expert alpinists can choose which top, which walland which "way" to cover. In fact, these ideal rock climbing routs are named “ways”. Comici Way, Messner Way, Soldà Way, Dimai Way, Dibona Way, Casara Way, are just few examples of their names. The habitof dedicating the streets a title without mentioning their pioneers (Friendship way, Women Way, Chiara Way, Elena Way, Symphony of windmills Way etcetera) was developed more recently, but this is subject to the risk of excommunication. There are Ways for everyone's likings. With good training and skills developed in the valley floor gymns and by practicing bouldering, free climbing or climbing on a cliff. Even if all of this way to climb are not propely Mountain Climbing. 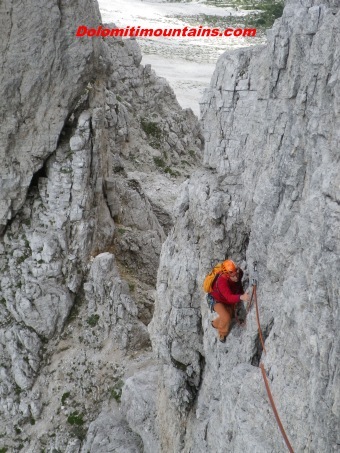 Learning to use technique of rock climbing gear is possible with the aid of an Alpine Guide and, for the brave, with a good partner. Generally on the beginning of summer, on the mountain areas, people can attend to Alpine Courses. It is not necessery to be goog at climbing to partecipate. The CAI (Club Alpino Italiano) or groups of expert, organize the curses, but always under the coordination of Alpine Guides, the only in Italy qualified by low to teach the climbing techniques. One must bear in mind that Mountain Climbing is not without risks, but it is compensated, however, by enormous amounts of satisfaction. The risks are those related to imperfect knowledge of techniques, overestimating ones' own skills, objective sources of threat (fall of rocks, ice, snow) and sudden weather changes (thunderstorms, snowfall, frosts). The satisfactions, huge, are those of going up where "only eagles dare" or peaks where few can arrive, experiencing the unique feeling of having "conquested" a piece of rock. Such conquest is only symbolic and ideal, because when one goes back home the rock stays at its place, but it will remain with us in our memory. A implication that often arises in this art is friendship: one goes to face the rock with at least one partner. The fact of spending entire days roped to another person often develops a strong sense of friendship and trust. Alpinists typically come from mountain villages but also from cities. Alpine Guides are very often citizens who are get in love with this environment and have changed their life to make a different job in a peculiar environment. In order to become an Alpine Guides, that is the only professional who is entitled to support people on the peaks and who may teach the technical trail and ski mountaineering for a fee, one must face a tough selection and a two years subsequent training. From the mountain villages come also the volunteers of Mountain Rescue (National Alpine and Speleological Rescue Corps), that is one of the two Corps charged with the task of alpine rescue service together with Gardia di Finanza S.A.G.F.) In Italy, rescue in rough terrain such as alps, canyons, ravines, cliffs, caves and all hostile environments is assigned by law to C.N.S.A.S. and S.A.G.F. working together.